I’m giving tulips another try. I’ve laid a wire mesh (similar to chicken coop wire) down to deter any intrepid bulb-eaters and diggers from upsetting the bed. My High Country Gardens order arrived last week, and I’m just now getting to planting them. I’ve decided on the middle rear bed to house my tulip ambitions. Twelve each of Tulipa bakeri and Tulipa humilis are sharing the bed with Eye of the Tiger Dutch irises, about 4 or 5 Muscari botryoides ‘Album’, and 3 large bulbs of Allium karativiense ‘Ivory Queen’. Flanking each end of the bed stand a white salvia greggii and a transplanted salvia microphylla Hot Lips, sparsely leafed after surviving the dry summer heat. I’ve left some room for a rosemary bush to keep the greggii company, and I plan on adding Muscari armeniacum and at least 6 Allium christophii to the mix. I’m still exploring more plants to populate this Cool-in-the-Shade White and Blue garden, especially since the current flower selection consists of early spring bloomers. Indestructible. Invasive. Resistance is futile. 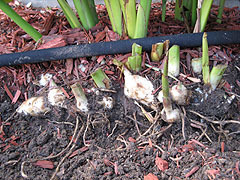 Where once there were two plants barely 2 feet high, now there exists a large colony of cannas, extending its dominion into my front flower bed. The tubers photographed this past weekend captures the aggressive nature of this plant; the root system covers about a 2′ by 3′ patch of bed, and there are no signs that it is letting up. I began dividing the roots and planting them in pots to grow babies for the new year. A problem I’m seeing due to having no gutters on our house is that water runoff tends to erode chunks out of your flower beds. I’m exploring the possibility of installing lava rock on top of the mulch to reduce some of the ugly pits caused by cascading rainfall. It’s back to weeding and winterizing the beds this Saturday. The weekend forecast threatens rain, but so far there are no clouds in the sky. I have a dozen plus Iris bulbs from Brecks that need to go in the ground ASAP. I also posted an order with Hill Country Gardens for some muscari, allium and tulip bulbs, and I’m looking forward to a trip out to Covington’s Nursery in Rowlett. They have a great planning guide for the October-November gardener. I discovered an interesting and cost-efficient way of making your own seed-starting pots out of newspapers while researching lava rock and mulching on the net. If only I were a seed-starter….